Optrafair will be the setting for a BCLA sponsored ‘Willy Wonka’ style competition this year. BCLA will be planting Golden Tickets within its branded chocolate stash on its exhibition stand. The Golden Tickets will enable people to win free entry to BCLA’s Clinical Conference and Exhibition in May 2015. 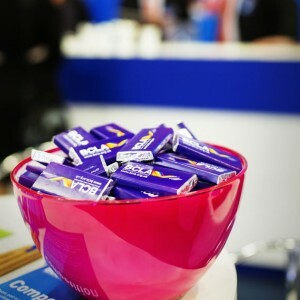 There will be a ticket packaged inside a BCLA-branded bar of chocolate each day of this weekend’s exhibition (on stand D40). We like inclusive strategies like this at 200m2. This is an interesting idea and certainly one which will encourage people to stop at the stand… especially the chocoholics visiting the show! The golden ticket is also a clever way to encourage people to participate in a competition. If you’re exhibiting at Optrafair and need advice on how to maximise exhibition footfall on your stand, we’re here to help. 200m2 is one of the UK leaders in modular exhibition stands and exhibition stand hire. Call us on 020 333 200 92 and one of our exhibition stand specialists will be happy to help you.